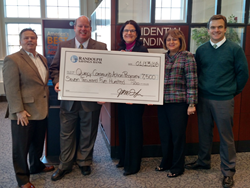 Randolph Savings Bank in its efforts to further its support of education and promotion of financial literacy presented a check to the Quincy Community Action Programs (QCAP) to partner with the organization in presenting consumer financial education seminars in Randolph. The $7,500 donation will fund programs on a variety of topic including budgeting and first time home buying. The first of the QCAP seminars, a two-part program focused on first-time home buying, will take place March 15 and 19. Quincy Community Action Programs, Inc. (QCAP) is a leading private nonprofit organization in the Greater Quincy area dedicated to reducing poverty and helping low-income people achieve self-sufficiency. QCAP was incorporated in 1965 and is one of 24 Community Action Agencies in Massachusetts. QCAP serves approximately 20,000 unduplicated people annually. Their service area includes Quincy, Weymouth, Braintree, Milton, Hull and surrounding Norfolk County and Randolph communities. With local management, local decision making, and local commitment, Randolph Savings Bank has been a part of the community for over 150 years. We happily serve businesses, individuals, families, and homeowners with convenient online and mobile banking tools, five full service branches, and two lending centers. With innovative products and outstanding service, Randolph Savings is a great place to bank. For more details, visit RandolphSavings.com.